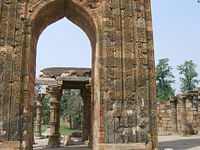 The Qutb complex refers to an array of monuments and buildings at Mehrauli in Delhi, India, the Qutub Minar standing out as the most famous. Qutb-ud-din Aybak, the first ruler of the Slave Dynasty, and his successor Iltutmish (aka Altmash) first constructed the complex in their new city, called the Qila-Rai-Pithora, near Prithivraj Chauhan's older city. Many subsequent rulers, including Iltutmish and Ala ud din Khilji as well as the British added to the complex. In addition to the most famous monument in the complex, Qutub Minar, other important buildings and structures stand in the complex, including the Quwwat-ul-Islam mosque, the Ala-I-Darwaza, the Alai Minar, and the Iron Pillar. Twenty-seven previous Jain temples had been destroyed and their materials reused to construct the minar and other monuments of the complex. That resulted in the creation of a unique, Indo-Muslim architecture, blending the gods of Jainism and Hinduism with the symbols and architectural designs of Islam. Qutub Minar (Hindi : क़ुतुब मीनार Urdu: قطب منار), the tallest brick minaret in the world, constitutes an important example of Indo-Islamic Architecture. 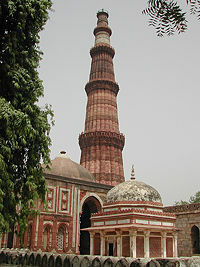 The tower stands in the Qutb complex in South Delhi, India. UNESCO designated the Qutub Minar and its monuments a World Heritage Site. Remnants of the earlier Jain structure. The purpose for building this beautiful monument, apart from the usual function of a minaret as a high place to call people for daily prayers in a mosque (the Quwwat-ul-Islam mosque in this complex), has been the subject of speculation. Some scholars have forwarded that hypotheses that Islamic leaders may have constructed the structure as a tower of victory, a monument signifying the might of Islam, or a watch tower for defense. Controversy surrounds the origins for the name of the tower. Many historians believe that the Qutub Minar had been named after the first Turkish sultan, Qutb-ud-din Aibak. Others speculate that that tower had been named in honor of Khwaja Qutb-ud-din Bakhtiar Kaki, a saint from Baghdad greatly venerated by Akbar. The Qutub Minar stands 72.5 meters high (237.8 ft) with 399 steps leading to the top. Although formerly closed, visitors may climb to the top of the tower for a fee of 500 INR, or about US $12. The diameter of the base measures 14.3 meters wide, while the top floor spans 2.75 meters in diameter. Many fine examples of Indian artwork from the late twelfth century C.E. surround the building. A second tower under construction with the plan to surpass the Qutub Minar stopped at about forty feet tall. Qutab Minar, the tallest brick minaret in the world, stands 72.5 meters. According to the Archaeological Survey of India (ASI), approximately twenty Jain temples once occupied the place where Qutub Minar stands today. Islamic rulers demolished them, reusing the stones to build the present complex. The ASI placed an inscription stating that ten meters from the base of the minaret. Jain tirthankar figurines can be found on many pillars and walls of the complex. 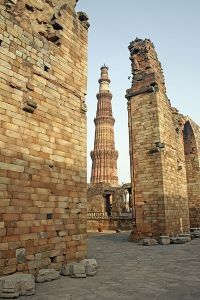 Qutb-ud-din Aibak, the first Muslim ruler of Delhi, inspired by the Minaret of Jam in Afghanistan and wishing to surpass it, commenced construction of the Qutub Minar in 1193 C.E., only completing its basement. His successor, Iltutmish, added three more stories and, in 1368 C.E., Firuz Shah Tughluq constructed the fifth and the last story. The minaret prominently displays the development of architectural styles from Aibak to Tuglak. Like earlier towers erected by the Ghaznavids and Ghurids in Afghanistan, the Qutub Mahal comprises several superposed flanged and cylindrical shafts, separated by balconies carried on Muqarnas corbels. The minaret, comprised of fluted red sandstone, had been covered with intricate carvings and verses from the Qur'an by Muslim artists. 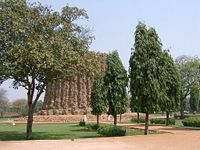 The Qutub Minar stands on the ruins of Lal Kot, the Red Citadel in the city of Dhillika, the capital of the Jat Tomars and the Chauhans, the last Hindu rulers of Delhi. According to the inscriptions on its surface, Firuz Shah Tughlaq (1351–88 C.E.) and Sikandar Lodi (1489–1517 C.E.) restored the structure. Major R.Smith also repaired and restored the minaret in 1829. Ala ud din Khilji started building the Alai Minar with the plan to construct the structure two times higher than Qutub Minar. The construction stopped after the completion of the 24.5 meter high first story, after death of Ala-ud-din. The first story of the Alai Minar still stands today. Qutb-ud-din Aybak built Quwwat-ul-Islam mosque (Might of Islam) (also known as the Qutb Mosque or the Great Mosque of Delhi). The mosque construction started in the 1190s, when Aibak, serving as the commander of Muhammad Ghori's garrison, occupied Delhi. Historical documents state that the mosque had been built with the remnants of twenty-seven Hindu and Jain temples destroyed by Muslim rulers. Historical records compiled by Muslim historian Maulana Hakim Saiyid Abdul Hai attest to the iconoclasm of Qutb-ud-din Aybak. Many types of structure still stand in the complex. Prithvi Raj previously built the Jain temple, which had been demolished to make way for the "Quwwat al-Islam," the first mosque built in Delhi. 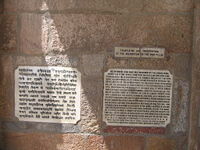 Parts of the Jain temple had been left outside the mosque proper. That pattern of iconoclasm had been common during his reign, although an argument goes that such iconoclasm had been motivated more by politics than by religion. It was the first mosque built in Delhi after the Islamic conquest of India and the best surviving example of Ghurid's architecture. Expansion of the mosque continued after the death of Qutub. His successor, Iltutmish, extended the original prayer hall screen by three more arches. By the time of Iltutmish, the Mamluk empire had stabilized enough that the Sultan could replace most of his conscripted Hindu masons with Muslims. That explains why the arches added under Iltutmish appear stylistically more Islamic than the ones erected under Qutb's rule. The mosque stands in ruins today but indigenous corbelled arches, floral motifs, and geometric patterns can be seen among the remaining Islamic architectural structures. To the west of the Quwwat-ul-Islam mosque stands the tomb of Iltutmish, built by the monarch in 1235 C.E. The Ala-I-Darwaza, a magnificent gateway in the complex, had been built by the first Khilji sultan of Delhi, Ala ud din Khilji. Inlaid marble decorations, latticed stone screens showcase the remarkable craftsmanship of the Turkish artisans who worked on the gateway. Art historians consider the Quw'at'ul Islam Mosque entrance, with its horse shoe shaped arches, one of the best examples of architecture during the Sultanat period. The iron pillar represents one of the world’s foremost metallurgical curiosities. Chandragupta II Vikramaditya (375–414 C.E. ), of the Gupta dynasty that ruled northern India 320–540, erected the pillar, standing nearly seven meters high and weighing more than six tons. Archaeologists identified Chandragupta II Vikramaditya based on careful analysis of archer type Gupta gold coins. 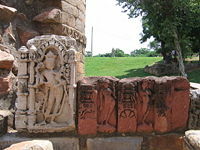 The pillar, with an idol of Garuda at the top, had originally been located at a place called Vishnupadagiri (meaning “Vishnu-footprint-hill”), identified as modern Udayagiri, situated in the close vicinity of Besnagar, Vidisha and Sanchi, towns located about fifty kilometers east of Bhopal, in central India. Vishnupadagiri sits on the Tropic of Cancer and, therefore, a center of astronomical studies during the Gupta period. The Iron Pillar served an important astronomical function, in its original site; its early morning shadow fell in the direction of the foot of Anantasayain Vishnu (in one of the panels at Udayagiri) only in the time around summer solstice (June 21). The creation and development of the Udayagiri site appears to have been clearly guided by a highly developed astronomical knowledge. Therefore, the Udayagiri site, in general, and the Iron Pillar location in particular, provide firm evidence for the astronomical knowledge in India around 400 C.E. The pillar represents the only piece of the Jain temple remaining, which stood there before being destroyed by Qutb-ud-din Aybak to build the Qutub Minar and Quwwat-ul-Islam mosque. Qutub built around it when he constructed the mosque. Translation of the inscription in English. The pillar bears an inscription stating that it had been erected as a flagstaff in honor of the Hindu god, Vishnu, and in the memory of the Gupta King Chandragupta II (375–413). Made up of 98 percent wrought iron of pure quality, it stands 23 feet 8 inches (7.21 m) high and has a diameter of 16 inches (0.41 m). Coal-fueled furnace would have been unable to achieve the high temperatures need to form such a pillar. The pillar serves as a testimony to the expert skill of ancient Indian iron smiths in the extraction and processing of iron. The iron structure has attracted the attention of archaeologists and metallurgists for its ability to withstand corrosion for the last 1600 years, despite harsh weather. Its unusually good corrosion resistance appears to be due to a high phosphorus content, which together with favorable local weather conditions promotes the formation of a solid protective passivation layer of iron oxides and phosphates, rather than the non-protective, cracked rust layer that develops on most ironwork. The government erected a fence around the pillar to prohibit the popular tradition of standing with your back to the pillar, making your hands meet behind it, as a token of good luck. The Qutub Minar at night. A wide range of architecture resides in the complex. Remains of Jain temple hallway inside the Qutb complex. Intricate engravings surround the crypt. Qutub Minar, as seen from a surrounding gate, and its height in comparison to people. Open areas serve as a restful place for the abundant visitors. Some areas of the complex have only a few structures still standing. Tourists flock to the complex daily. ↑ J.A. Page, "An Historical Memoir on the Qutb, Delhi" in Memoirs of the Archaeological Society of India (New Delhi: Lakshmi Book Store, 1926). ↑ Maulana Hakim Saiyid Abdul Hai "Hindustan Islami Ahad Mein" (Hindustan under Islamic rule), Eng Trans by Maulana Abdul Hasan Nadwi. ↑ Columbia.edu, Index_1200-1299. Retrieved February 1, 2008. India. Qutb Minar & the Qutb Complex. New Delhi: Publication Division, 2005. Jain, A. C. A Guide to the Kutab Minar. Delhi: Jainco, 1900. Entry in the UNESCO World Heritage Site List. 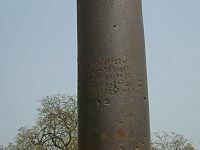 Corrosion resistance of Delhi iron pillar. Photo gallery of the Qutb complex. Qutb Minar from satellite, recognizable by its long shadow.